For 13 years, Amanda has managed the sustainability portfolio for BSI. She sits on the BSI Energy Management and Green House Gas committees as well as the Emissions Trading Group who advise the UK Government on emissions trading implementation issues. Her most recent work has included the update and release of ISO 50001:2018, the international standard for Energy Management Systems. 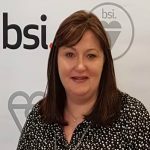 Amanda manages the accreditation of BSI’s certification body from UKAS and has the responsibility for coordinating BSI’s certification activity in Europe for companies that wish to use ISO 50001 to demonstrate ESOS compliance. This will include companies moving from the old, to the new version of the standard.